Crowdfunding will begin June 1st on Indie-gogo. At the same time, we will be seeking private donations and sponsorship to help this program take off. The amount we seek is the bare minimum to ge the show produced properly and safely and produce effective entertaining and educational material that inspires youth. If we can raise more, then we would be able to bring even more to the screen, and ultimately to today’s youth. We don’t expect something for nothing and hope to provide something that funders can use.. 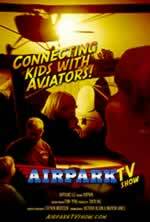 In return for pilot production crowdfunding, sponsorship, donations, grants, we have a variety of perks, gifts, website and or show credits & depending on the level of sponsorship/crowdfunding, even valuable customized videos that funders can use to promote their support of Airpark. The pilot project by itself, will be designed to engage, reach out to, and help youth, so it is a perfect CSR solution for companies seeking to find a program they would be proud to sponsor. You just can’t go wrong helping to fund a program that helps kids. Television production, done right, is not cheap. To do this the right way and deliver a professional piece that works, we are seeking to raise $75,000+ via crowdfunding and private sponsorship /donations to complete the 22 minute television episode with ALL of the segments. This isn’t a few students going out with their DSLR cameras to play TV producer, this is the real deal. While we will engage student apprentices, the show will be designed, directed and produced by seasoned award winning professionals. The initial show, while being used as a pilot / demo to achieve funding for a full episodic series, will also be promoted, either in whole, or in special segments, and made available to sponsors, schools, non-profits that are reaching out to children. Television distribution deals can take a long time to get together, in the meantime, we will also be using the pilot show to seek other distribution avenues besides television that will offer great opportunities to sponsors to advertise or promote the goodwill, CSR efforts of their companies or associations. These could include, web-series, podcasts, digital downloads, in-flight entertainment, filler programming, DVD distribution, as well as integration in the supporting website operations. Show Sponsors & Feature Segment Sponsors– for 1 or more of the 3 segments of the show. After opening credits, these sponsors will have “Airpark is brought to you by…” tag and logo. Branded Segment Sponsors- production of a segment featuring sponsors product or service or lower third bug that identifies sponsor as sponsoring that particular segment. Opening Bumper ID “This episode of “feature name” is brought to you by. We are seeking help from individuals and companies that could benefit from the sponsorship of a program that reaches out to youth to promote aviation. We hope that those in the aviation industry, will see that it is also in their interest to help get youth interested in aviation. If you can help, please contact us. Thank You! This is NOT a solicitation to invest nor is there any promise of anything beyond what is stated above. 1 Perks and Gifts subject to change at any time. Once IndieGogo is started- perks at their funding levels will remain the same throughout the end of the campaing. Other levels of sponsorship may be added or removed.